The decline of bricks-and-mortar and rise of online retail has only just begun. What's behind today's evolving retail environment? 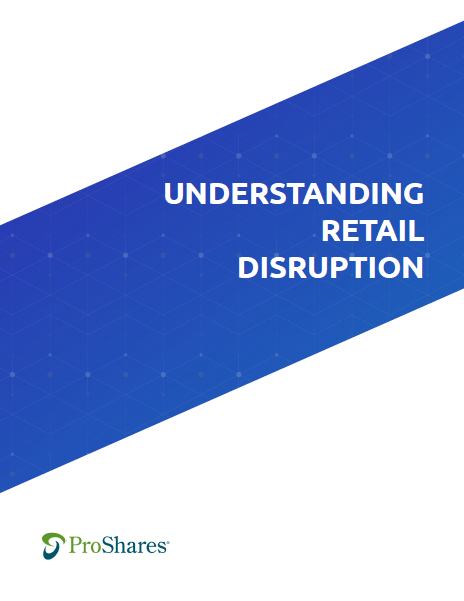 Understanding Retail Disruption provides an in-depth analysis of the market and business forces driving the long-term secular decline in bricks-and-mortar retail and the rise of e-commerce. This report also discusses the Solactive-ProShares Bricks and Mortar Retail Store Index, which is positioned to become the standard way financial markets measure the performance and health of the legacy physical retail industry. Ready to Invest in Retail Disruption? The massive disruption in retail presents a significant investment opportunity. Visit the Retail Disruption Opportunity at ProShares.com for complete information about ProShares Long Online/Short Stores ETF (CLIX) and ProShares Decline of the Retail Store ETF (EMTY), the first ETFs specifically designed for investors to benefit from the changing retail landscape. Download fact sheets, product profiles and prospectuses, access current fund performance, see daily fund holdings, review distributions and more.